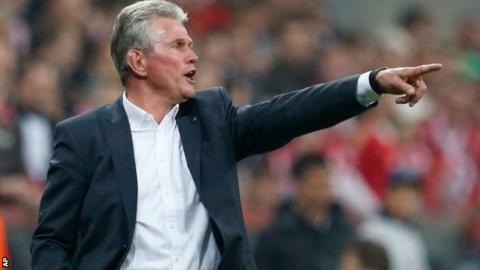 Bayern Munich coach Jupp Heynckes insisted he was not surprised by their performance as they thrashed Barcelona 4-0 in the Champions League. Heynckes, 67, is on the brink of taking Bayern to their third Champions League final in four years after a crushing victory in the Allianz Arena. He said: "We've been playing extraordinary football all season. "It was not a really big surprise to me that we scored four goals. We have played to a high level all season." Heynckes - who will be replaced by former Barcelona coach Pep Guardiola at the end of the season - insisted before the game that he would not seek any information on Barca from his chosen successor. And it was Bayern who were utterly dominant in front of their own fans, cruising to a deserved win with two goals from Thomas Mueller added to by Mario Gomez and Arjen Robben. Barcelona may have had 63% of possession but were subdued as Bayern restricted them to only four attempts on goal all night. "You have got to analyse the other team and I did that," said Heynckes. "How do they play? What is their style? Where do they move? You have got to have something to hold against that and I did that. "I had a powerpoint presentation to show the different ways Barcelona work and move. My team was very tactically disciplined." Bayern, who last won the Champions League in 2001, are now huge favourites to book a place in next month's final at Wembley. They were beaten on penalties at their own ground by Chelsea last season, while Jose Mourinho guided Inter Milan to a 2-0 victory over the Germans in 2010. Heynckes said: "My players were fantastic again. Falling short of success in the past two seasons has only made them more hungry for success this year. "We defended so well and in possession we have style of play going forward. We have a lot of creativity and a lot of class and quality. "The fact that we did not concede a goal was very important and the fact we scored four goals was even nicer for us." Barcelona's chances of reaching the final look slim at best but Heynckes refused to say the mauling is the end of an era for the great Catalan side. He said: "Barcelona were very strong and they are still one of the best teams in the world. No-one can dispute that. They are one of four strong teams in the Champions League semi-finals along with Bayern Munich, Borussia Dortmund and Real Madrid. "Barcelona are a fantastic team and that is why you can only rate this victory even more." Bayern Munich: Their best ever team? Read more on Bayern Munich: Is this their best ever team?